Unless you have been in a cave for the last decade you will have heard of the mystical technology that is 3D printing. A whole decade did you hear me say? Well actually, according to Wikipedia, 3D printing, or Additive Manufacturing, has been around since the 1980s. So really there is no excuse to not have heard of it. In a nutshell 3D printing is the process of making three dimensional objects from a digital file – with conventional printers this is done by extruding plastic layer by layer in order to build up an object/s. When you see the kind of stuff you can make with it (pretty much anything!) 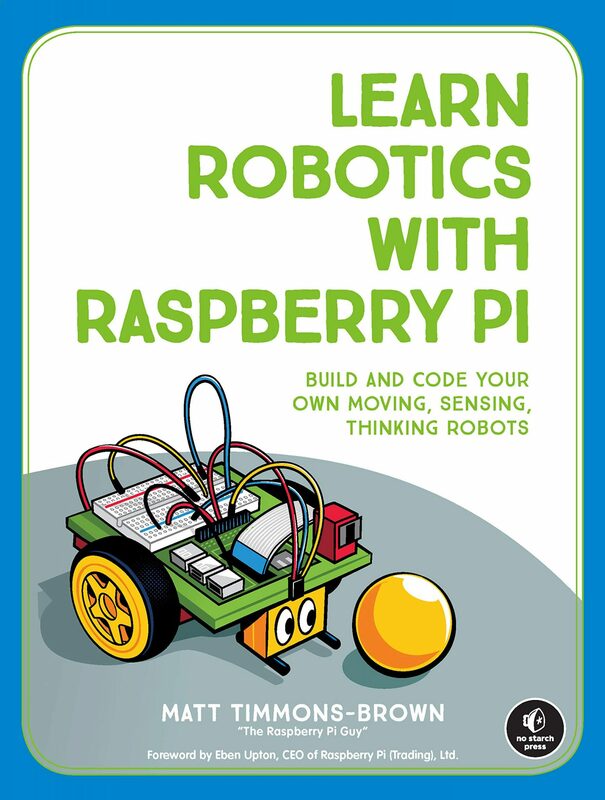 you’ll quickly be blown away and wonder no more why I have always had an interest in it! Therefore I had no hesitation at all in saying yes when Ultimaker, a popular Dutch 3D printing company, approached me and asked whether or not I would be interested in receiving a loan of an Ultimaker 2. 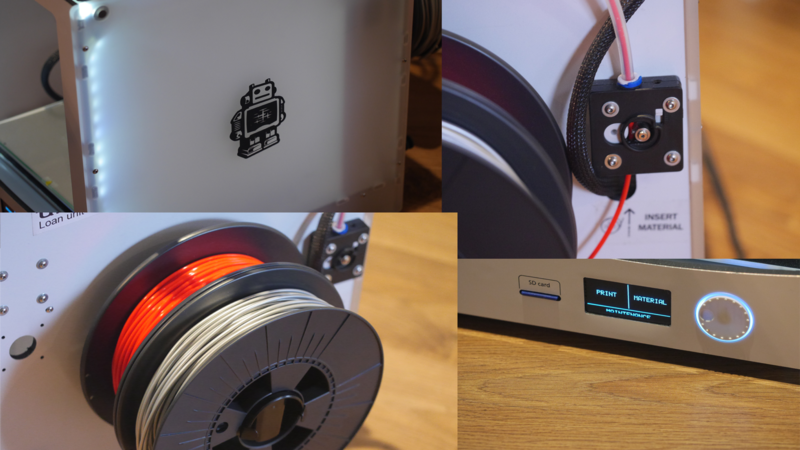 Considering the fact that Ultimaker are widely regarded as the consumer-market 3D printing leaders I thought that I would share with you my one-month-long experience with their latest model (the Ultimaker 2 family retails from £919.20 excl. VAT). This is from a novice perspective – I have only used 3D printers once or twice before! So! Let’s start with the facts. 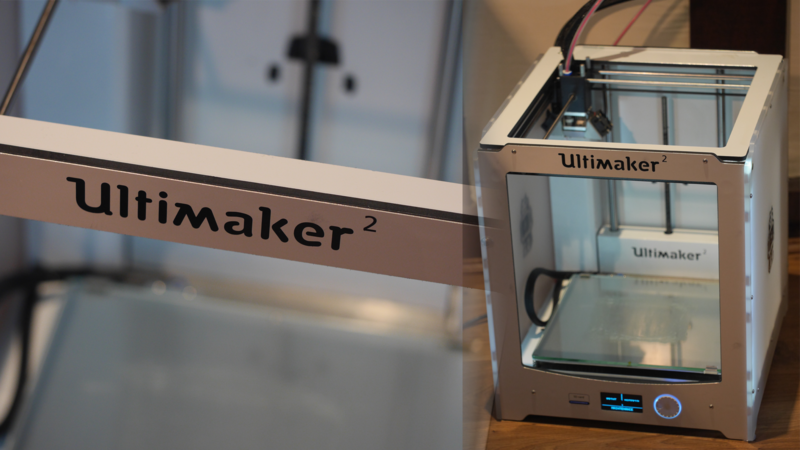 In the Ultimaker 2 range there are three models: the Ultimaker 2 Go, the Ultimaker 2 and the Ultimaker 2 Extended. These come with a variety of build sizes however the basic technology behind them is the same (ie: the print nozzle etc.) Over the last month I have had the Ultimaker 2. This is a printer with a build volume of 223 x 223 x 205mm (that is huge) that can print at a resolution of up to 20 micron with speeds between 30 mm/s and 300 mm/s. The nozzle can be set to anything up to 260 degrees celsius and the Ultimaker 2 features a glass heated bed that can reach 100 degrees celsius. These are all impressive specifications for a high end consumer level 3D printer. Also note that wattage-wise it consumes up to 221 watts and, according to Ultimaker, has an “average operational noise” of 49 dBA. From my experience the Ultimaker is fairly loud, but not so loud that I couldn’t bear having it in my room – in no way was it as loud as a conventional inkjet paper printer say. As I have said, the Ultimaker 2 range are high-end consumer 3D printers and Ultimaker aims to create devices which print high-quality items easily and reliably more than the RepRap motto of creating “general-purpose self-replicating manufacturing machines”. The fancy specifications and high-end stepper motors, belts and other components used in the Ultimaker 2 does mean that the price is not one to be taken lightly: £1414 excl. VAT in the UK. Whilst this is expensive compared to some of the lower-end RepRap ones, the price of the Ultimaker puts it into the same kind of category as other market-leaders, such as MakerBot. One of the first things you notice about the Ultimaker 2 is the aesthetics: it is a nicely designed piece of kit. The matted plastic and bright LEDs project a modern and premium feel. The electronics and stepper motors are concealed in the corners and on the bottom of the unit. Users interface with the printer using the scroll wheel on the front. Ultimaker have a simple menu system where you can do basic tasks such as change the material and align the bed. More complex tasks, such as messing around with the actual 3D print settings are configured in Cura, Ultimaker’s slicing software – this is where you convert your 3D model (designed in SketchUp etc.) into the G-code that the printer reads. If you turn the Ultimaker 2 around you will see the feeding mechanism and space for two reels of material, in my case silver and red PLA. The Ultimaker can print both PLA and ABS however one at a time. Changing materials is a relatively painless process and the plastic lasts for ages – depending on where you buy from a reel of PLA will set you back up to £30. The feeding mechanism is what grips the plastic and propels it through the 3D printer. For the most part this is a great little mechanism however it can become problematic. On several occasions I have heard the familiar “clicking” of when the plastic has become jammed and the feeding wheel has worked itself into the plastic. This normally takes about 5-10 minutes to fix and again this is relatively painless – Ultimaker have fantastic support both on their website and through their custom support email system. The end-to-end printing process with the Ultimaker 2 is incredibly slick. 1) Design a model on the 3D modelling software of your choice. Over the years I have had a lot of experience with Google SketchUp and so this is what I have been messing around with. After you have finalised your design (use a pair of digital calipers for measuring real world items – priceless bit of kit!) simply export in the .stl format. But what if 3D modelling isn’t your cup of tea? Well the internet is your friend! Simply hop on a website like Thingiverse and download anything that takes your fancy! What’s the next step? 2) Import the .stl file into Cura. 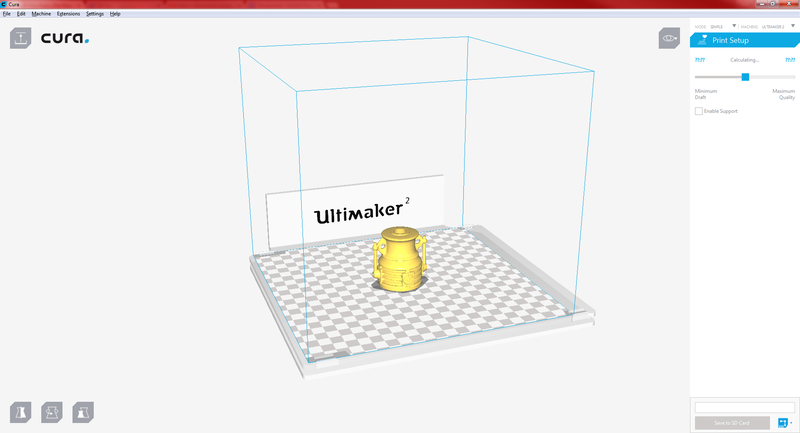 This is Ultimaker’s slicing software and it allows you to fiddle around with the settings for your print. The program is fast, easy to use and, as it was produced by the company that makes the actual hardware, it compliments the Ultimaker 2 perfectly. Using Cura’s various tools you can scale, mirror and manipulate your model to exactly how you want it. The slider in the top right is then available for user adjustment – it edits the quality of the model. Simply slide to the right for maximum quality, and slide to the left for the lowest quality. Maximum will of course slow everything down, make the layers smaller and enhance the precision of the 3D print – at what cost? Time. Depending on the quality you set it, Cura calculates (very accurately!) how long the thing will take to print – if you have a large model you may see the print time increase to tens of hours! For the most part however 3D printing on the Ultimaker 2 is the fastest you can get in the consumer market at the moment. 3) With your settings down, simply save your G-code to an SD card and insert into the Ultimaker – the menu system will then guide you through setting things up. For PLA the bed will warm to 60 degrees and the nozzle to 210. Cover the bed in a thin layer of PVA glue and voila! Your Ultimaker should just start to print! From my experience I would say that this happens around 3/4 of the time. The other 1/4 for me didn’t start for a variety of reasons but mostly this is due to the print head being jammed – this, however, is fixed within the space of 10 minutes with a quick atomic clean. 4) Let the printer do its magic! I have found them to be oddly mesmerising so try to prise your eyes off of it and get on with doing something else! This is just an example of what I have printed and as you can see the overall quality is very good indeed – the letters and numbers on the HDMIPUCK are defined and the different parts of the gear wrap have come out accurately and well. These were printed on around half quality, and for example the HDMIPUCK took around 5 hours to print (5cm radius). Originally I had a few problems with the overhangs – parts of the print which are not being built directly on top of the bed or other layers – but with a bit of tinkering and some Googling these were problems were quickly reduced and eventually eliminated.